As he began his litany, I heard things that were so appalling, I was somewhat dumbstruck by the audacity of his claims – which he firmly believed was true – to the point I closed my mouth and just listened. Before I had a chance to step in and rebut the group’s esteemed knowledge leader (yes, sarcasm), the food had arrived and discussion veered into other topic areas. I never had a chance to lay out the opposition, and sadly, those who listened never got to hear where the truth really lies. It does bug me that I never forced my way into the conversation to correct these horrible “truths,” but those who know me also know that’s not my style. I’m not comfortable with it, and I won’t apologize for being me. I think part of the problem was the sheer outrageousness of a couple of these claims – especially the last one – that I couldn’t quite get a grip fast enough to respond. So after a couple of weeks of letting it marinate in my brain, here’s my rebuttal. Will said speaker ever see it? I don’t know. But I do hope that someone, somewhere, will correct his fallacies and redirect his thinking. Let’s ignore the implied superiority of colonialism of the last statement. The first one is indicative of the impressions of a lot of the majority of America’s population: Natives are a forgotten culture and sadly, many Americans believe that Natives no longer exist. As to the truth of his statement of fact, it’s total BS. There are 44 federally recognized tribes east of the Mississippi River, and more than that which are state recognized. Now, I could give him the benefit of the doubt that he was specifically thinking of the DC-MD-VA region, since that’s a common argument by fans of the football team, that “there are no Indians here, so there’s no one to really care about misrepresentation.” In that case he’d still be wrong, since there are two state-recognized tribes in Maryland, and 11 in Virginia. This isn’t a ‘liberal’ issue, nor is it a political one. This isn’t being raised and fought by white Democrats. It’s an issue that has found rising support in Indian Country, and continues to build momentum. Actually, 81 years ago when the name was given. And back then, if you cared to remember history, was a time of racial insensitivity, ignorance, and bigotry. 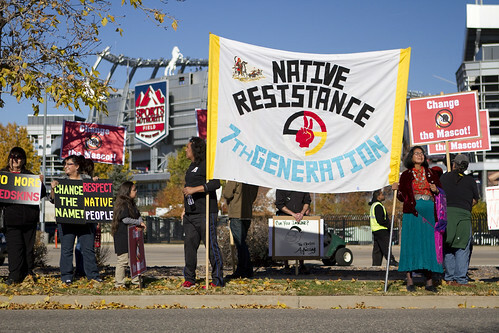 The National Council of American Indians lodged a protest about the name in the late 1960s, as the American Indian Movement and other groups found their voices fresh from the Civil Rights Movement. The first trademark suit was brought about in the late 1990s. And there’s been protest about the name for more than half the life of the team. It’s just loud today because Natives are finding a new digital voice with the fast rise of social media and a new generation who want to correct the wrongs so long visited upon Indian Country. Ah, two classic rejoinders tossed in together. I don’t much care if his friend – and I’ll give benefit of doubt about the claim and assume his friend IS Native – calls himself a Native, an American Indian, an indigenous person, or a First Nations member. It’s immaterial. Second, so what if a Native isn’t offended by the name? There are many who don’t care/ignore racial epitaphs that demean their race. The problem is that there is a sizable portion in Indian Country who *are* offended by the word, which is also a dictionary-defined slur. Third, the “other things to worry about” line. So, by such thinking, we’re only allowed to concern ourselves with one issue at a time? Some believe the slur is part of the foundation of problems that plague Indian Country. (Some don’t.) Why can’t we fight against poverty, alcoholism, education, health, and other issues at the same time? This kind of goes back to the previous point, though I’ll address the last statement now. The example brought up was the high school on the Navajo reservation, which does use the word as their team name. But context is needed to understand just why it’s in use there. 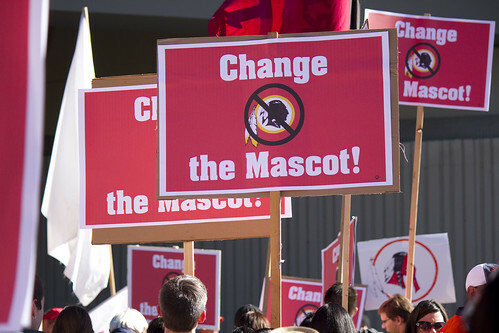 Oh, and in the last decade or two, more than 1,000 schools/institutions who used Natives/images as mascots have since changed them to something else. I’m not entirely sure how to handle that statement. Let’s set aside that the whole Bering Strait land bridge theory isn’t fact. (It’s treated as such orthodoxy, but it’s really not been proven true; in fact, there’s more research that is debunking it now than before.) The whole “Asians get drunk faster” is a complete myth. Natives do have a higher risk of alcoholism due to genetic susceptibilities based on how its metabolized, yes. But it’s not proven to be the same genetic factors as Asians. Yes, alcohol abuse does have a factor in suicide. But there are other factors in play within Indian Country besides substance abuse. Most recently, research among Native youths shows that poor self-image due to the harmful impact of racist representations on the self-esteem of AI/AN youth creates a hostile learning environment in K-12 and postsecondary schools. This plays a heavy factor in youth-related suicides among Native youth. I think the hardest part of the whole evening was listening to ‘facts’ being bandied about as essential truths, with no admission that these statements are ignorant or representative of microagressive racism. Honestly, the last time I observed such one-sidedness was a rabid political argument between Reds and Blues, where neither side would acknowledge any statements by the other side as true or even just worth consideration; they were all beholden to their party flavor and wouldn’t budge. The whole football name debate is in the same camp, though here the conversation is dominated by the team’s fanbase. They repeat the fallacies with gusto, like using a megaphone, and refuse to sit and listen to the other side – because it means that they’d have to admit the possibility that the thing they know and love and worship could possibly be offensive. There are two poll results that show the hypocrisy and absurdity of it all: 56% feel the word is an inappropriate way to describe a Native, yet 66% don’t want the team to change its name. And yet if the name changed, 82% wouldn’t care if it changed or not. If changing the name isn’t a big deal to you, then why argue about it with such outrageous ‘facts’ and superlatives? I’m sorry your had to put up with that, B. You fight in your own way, on your own turf and in the manner and time of your own choosing. Much better than being drawn into what you described. Being confrontational can be highly counterproductive to any cause, and often leads to results one does not want. Wisdom comes slowly with time in many cases. Anyway, so it was good that you did not attempt to intervene; if the person in question was some manner of “professional fact-speaker”, it would have went straight to heck because the scene was already at the ugly level with the speech as relayed above.